Laser Hair Removal: A Holiday Gift Idea + New Year's Resolution in One! Over the past few weeks, we have been featuring our favorite holiday gift ideas, but there is one gift idea that I want to dedicate an entire post to -- laser hair removal. This gift stands out because it erased one of my biggest insecurities and added convenience to my life. It's not only a fabulous holiday gift idea, but it may also support a New Year's resolution if you set the goal to attend regular appointments to eliminate some of your unwanted hair. Personally, I set a goal to pursue laser hair removal at spa810 Dallas earlier this year and am now able to reflect on the positive experience. Let me start by sharing a flashback to the moment that I decided to set a New Year's Resolution to pursue laser hair removal. I was pregnant and had an appointment with my doctor. My pregnancy made it difficult to shave my legs and so I came up with a solution - I wore knee socks to cover my lower legs. I felt slightly embarrassed, but it was such a struggle to shave my legs at the time. I remember wondering if my doctor thought that I was crazy for continuously wearing knee socks to my exams. I am sure that many of her patients find themselves in this predicament, especially when they are toward the end of their pregnancies. I am sure that none of us fool her with our knee socks, but she is sympathetic to our exhaustion and insecurities. Still, I vowed back then that I would have laser hair removal once I was done with pregnancy and breastfeeding so that I would never find myself obsessing over an insecurity that is so easy to fix. I am proud to report that I followed through on my goal to lessen unwanted body hair after my son was born and I finished breastfeeding. 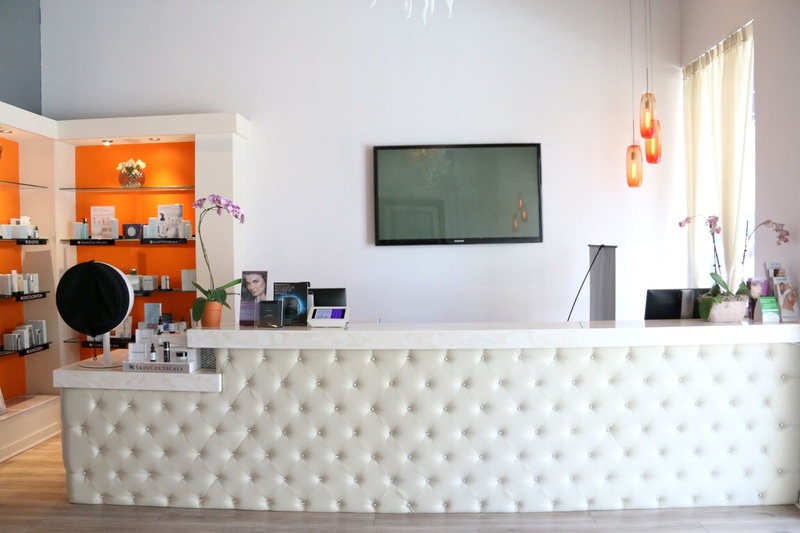 Earlier this year, I began my laser hair removal journey for my legs, Brazilian area, and a few stray hairs on my torso at spa810 Dallas. My experience has been fantastic. Now that it is December, I am almost done with my treatments and love the results. The sessions have not only removed the bulk of hair that bothered me, but they also erased insecurity that I have carried with me for decades. After several laser hair removal sessions with serious results, I realized how freeing it was to shed the paranoia that I used to experience on days that I didn't have time to shave or when I realized that I missed shaving a spot. Letting go of those worries has been amazing. Let me be realistic by telling you that this is not an overnight process. As someone with fair skin and dark/course hair, I noticed a big difference after my first appointment and continually noticed differences throughout the course of my treatments. By the 6th treatment, I achieved dramatic results and had an ah-ha moment where I realized that the process truly removed an insecurity that I had carried for many years. I decided to visit an indoor waterpark with my family on the spur of the moment. I realized that I didn't need to shave. Typically, I would shave in the shower, dry off, and then obsessively double check whether I missed any stray hairs. I would often nick my skin or experience razor burn. It was nice to reflect on how my New Year's resolution changed my life in terms of both convenience and confidence. As I mentioned, I want to be realistic about my goal and experience. I still have some body hair, but it is sparse and thin. It's hardly noticeable. I have two more laser hair removal sessions left and look forward to finishing the series of treatments. Laser hair removal has been a gift in terms of my confidence. It feels good that I set a goal and am almost done achieving it. I highly recommend pursuing laser hair removal as a New Year's resolution. Of course, a series of laser hair removal treatments is also a fabulous holiday gift. If you would like to experience laser hair removal, be sure to do your research to select a reputable business that comes highly recommended. Personally, I spent hours reading about laser hair removal and reading reviews about different spas. In the end, I chose spa810 Dallas and have been thrilled. I really like the customer-centric culture of their spa. The visits have gone by quickly with serious results. I look forward to my visits because I know that I am making progress toward my goals. Finally, I like the philosophy at spa810 where they want clients to be comfortable. They know that many people are new to the laser hair removal concept, so they offer a free session on a small area for new customers. I am not aware of any other spas in our area that have this customer-centric offer. It says a lot about their customer service. Learn more about spa810 here.